Our complete filter kit for Scout II is the easiest way to update all systems at once! Kit includes premium filters; oil filter, air filter, fuel filter kit, vapor canister, and transmission filter. 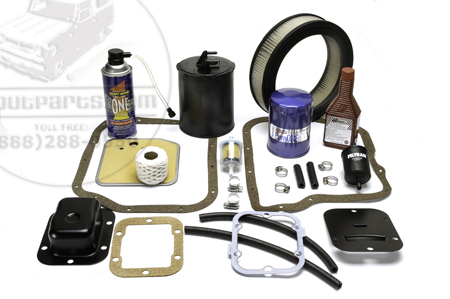 Manual transmission kits include our side mount 4 speed filter kit which mounts to the 6 bolt PTO cover. Automatic transmission kits include a full transmission flush kit as well as a pan gasket and filter kit to keep your automatic shifting smoothly.